I'm going to attempt to make a case that we could explain some of the anomalies in labor market behavior and in the current sluggishness in real GDP growth by thinking about the housing sector and some of the implications of the financial crisis and the recession for the sectoral reallocation of resources. The phenomenon of a shifting Beveridge curve has drawn a lot of attention. I first learned about this from a talk Bob Hall gave in early July, and Rob Shimer has for some time featured this on his web page. Basically, the idea is that, given the current vacancy rate in the labor market, the unemployment rate would be much lower if we thought that the Beveridge curve (the observed negative relationship between the unemployment rate and the vacancy rate) were stable. Dave Altig has written about this, and Tasci and Lidner have claimed that the shift in the Beveridge curve we are seeing typically happens in the recovery phase of recessions. However, they are relying on pre-2000 vacancy rate data, which is notoriously poor. Altig's conclusion is that we have to wait and see more data before we can say much about this. In any event, even if we thought that the Beveridge curve always shifts in this fashion during a recession, that could still indicate that mismatch in the labor market is important. During a recession, and maybe particularly this one, an important element of the recovery is that job vacancies and unemployment may not be well matched, in terms of the skills firms want and the skills workers have, and in terms of where the vacancies and unemployment are located. Further, in another post, I illustrated another way to look at the vacancies/unemployment data. Suppose we think about a standard Cobb-Douglas matching function, of the kind that researchers use when fitting Mortensen-Pissarides search models to the data, and include a "productivity" coefficient that measures the efficiency of the matching process. Then, measure matching efficiency as you would a Solow residual. I did that, in a crude fashion, and found a huge drop in matching efficiency, beginning in early 2008. Why not look at some other data, to see if we can get more information about what is going on? Wikipedia, my favorite in-depth source of information, actually has a nice summary of BLS unemployment rate data by states, complete with color-coded maps. There is clearly a lot of dispersion, though I have no idea whether this is unusual or not. Unemployment rates differ from a high of 14.3% in Nevada to a low of 3.6% in North Dakota. The states where the housing market crashed are doing particularly poorly (California, Nevada, Oregon, Florida), as are states where manufacturing is in long-run decline (Indiana, Illinois, Michigan, Ohio). States west of the Mississippi and east of the Rockies are faring relatively well, but some of those states are not so populous. However, centers of population such as New York, Texas, Virginia, and to a certain extent Minnesota and Wisconsin, are doing better than average. We would presumably be safe in assuming that a Beveridge curve relationship holds at the state level so that, for example, North Dakota should have a very high vacancy rate and Nevada a very low one. However, we don't know for sure what the state-level vacancy rates are, as that data does not seem to be available. In any event, it seems safe to say that, if I live in Las Vegas and am seeking employment, I would be much better off looking for work in Fargo, Minneapolis, New York City, Austin, or Washington, D.C., than in Las Vegas. However, there may be unusual factors that are impeding migration. For example, I may be unemployed in Las Vegas and own a house, which is currently underwater, and I do not want to default on my mortgage. Maybe the house is not underwater, but it is very difficult to sell. Now, what about the general characteristics of the unemployed? From this table, we can see that they are more likely to be men, more likely to be black, and more likely to be less educated, than for the population as a whole. Again, I have no idea what this pattern looks like relative to the typical recession. However, it is certainly consistent with mismatch in terms of skills, i.e. the vacancies are for high-skill workers but the unemployed have relatively low skills. We need the other side of the story though, so we need to look at what has been happening across sectors. The chart shows employment by sector beginning in 2000, with everything normalized to 100 for the first observation. We see a large and steady decline in durables and nondurables manufacturing, and a steady increase in services and government. Construction booms until sometime in 2007, then tanks. The shift from manufacturing to services has been happening for a long time. This, along with observations on the skill premium in wages, indicate a fundamental shift from low-skill to high-skill jobs. However, the housing boom we experienced, in part due to incentive problems in the mortgage market, which you can see reflected in construction employment in the chart, soaked up some low-skill labor that was being shed by the manufacturing sector. Thus, the housing boom effectively slowed down or negated the long-term adjustment that was occurring in labor markets. Once the housing sector collapsed, the need for sectoral reallocation of labor hit with a vengeance and, we could argue, contributed to the very high unemployment rate we are seeing. 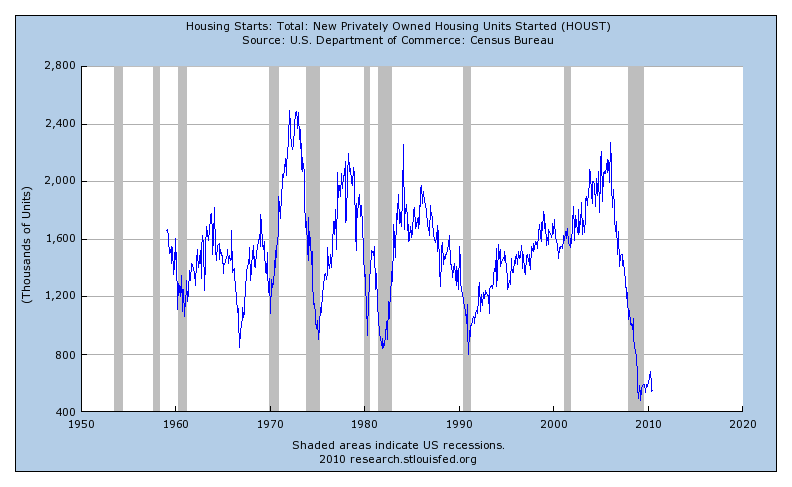 The crash in housing market construction is phenomenal, as you can see in the housing starts time series in the chart. Housing starts fall beginning in 2007, and are currently at a lower level than at any point since 1959. Basically, the incentive problems in the mortgage market caused the US economy to build a large quantity of houses and other structures on false pretenses. Think of what would happen if you take an economy that is on a steady state growth path and drop a large stock of houses on it. That is essentially the state we are in now. This reduces the relative price of housing, and people stop building houses - for a long time. Notice in the chart that housing starts typically bounce back quickly in a recession - housing starts is typically a leading variable. That will not be the pattern in this recession. It will take a considerable time before depreciation and growth in the demand for houses take up the slack, housing prices increase, and new construction starts to pick up. In the meantime, workers formerly employed in the housing sector will be looking for work in other sectors, where their skills may match poorly with what employers are looking for, and the job vacancies may be in other parts of the country. As further evidence for sectoral reallocation in explaining current labor market behavior in the US, consider what is going on in Canada, as I do here. Canada had none of the US problems in its mortgage market, it experienced a similar pattern of GDP growth during the recession (though their recovery is stronger - further evidence for my claims), and housing construction in Canada has followed a typical cyclical pattern. Indeed, Canada is currently experiencing something of a real estate boom. However, the change in the unemployment rate in Canada during the recession was considerably smaller, to the point where the Canadian unemployment rate is currently lower, whereas the unemployment rate in Canada tends historically to be much higher than in the US. Finally, the next chart shows a crude measure of average labor productivity - household survey employment divided by real GDP - for the US. 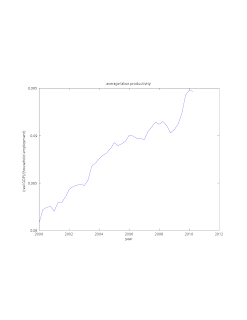 An important anomaly here is the large increase in average labor productivity during the recession. Historically, average labor productivity is procyclical - if it was behaving is it would normally, it would have gone down. One view is that this is the silver lining of the recession. We are shedding inefficient firms, and some Schumpeterian process is making the US economy much more productive and setting the stage for future growth. However, we might also view this as a composition effect. The dramatic fall in housing construction, which is a low-productivity industry, is increasing aggregate average labor productivity, and the other sectors aren't really considerably more productive at all. Maybe there is no silver lining, or it's not so shiny. It seems to me that there is a good case for what Kocherlakota says here, that there is little or nothing the Fed can do about the currently-high unemployment rate. 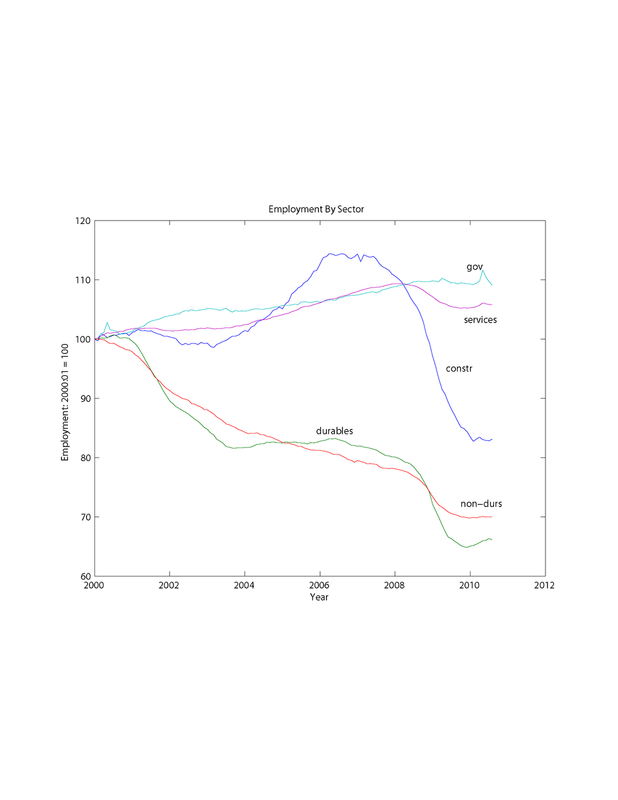 This is due to wide dispersion in geographical and sectoral unemployment and vacancies. There is a sense in which the Fed can move resources from once sector to another - indeed, that is part of what it did when it purchased a large portfolio of mortgage-backed securities. That moved resources from other sectors into the housing sector. But the resources moved in the wrong direction, working against the adjustment that needs to happen. I don't see a particular fiscal role that comes out of the sectoral reallocation story, other than a long-term re-evaluation of the adequacy of our unemployment insurance system and our system of public education. 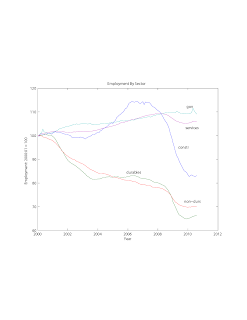 How geographically dispersed was unemployment in previous recessions? On the productivity issue, some people (such as Hall and Krugman) have claimed that productivity was also countercylical in the last two US recessions. I'd be interested to hear your thoughts on that, eg do you interpret the data differently or would you agree that this is a feature of "modern recessions". Steve: the most 'granular' data we have for vacancies is at the regional level (NE / South / Midwest / West). Re Anon #2's comment, I have seen some research making the same argument - will update on this later. He draws a distinction between old-economy recessions, the last of which is 81-82, and the last two recessions preceding the current one (he's writing in 2007). An interesting feature is that it reflects the common view at the time that the monetary policy problem had been solved, i.e. he thought that monetary policy had been dampening the fluctuations, in part giving rise to the "Great Moderation." A critical observation he makes is that in modern recessions productivity goes up, i.e. small decline in GDP, large decline in employment. He tends to dismiss sectoral reallocation as an important driving force. However, look at the last two charts here. 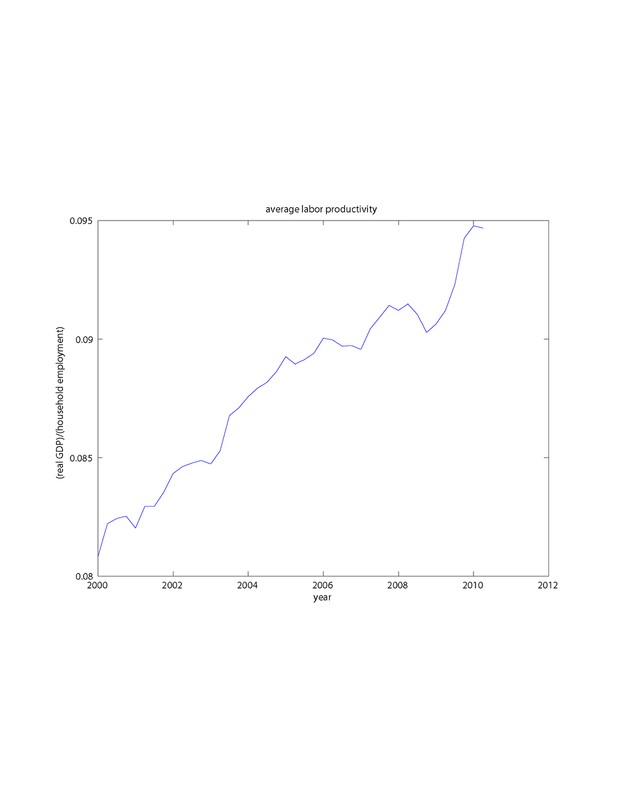 The increase in productivity is very large (though of course the recession is "large" too. 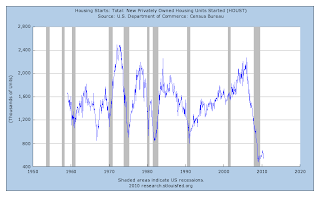 Further, while there was a fairly typical old-recession drop in housing starts in the early 1990s recession, the housing sector sailed through the 1991 recession with nothing much going on. Clearly the massive collapse in housing is an idiosyncratic feature of the current recession that you have to worry about. Clearly, you have to do the research to sort this all out. I'm mostly making suggestions here. Kocherlakota says unemployment would be about 6.5% if the labor markets were as efficient as in normal times. That's a percentage point or two above steady state unemployment. This suggests there is still room for AD policy. This post make a fairly convincing case that some of the increased unemployment during the current recession may be due to structural issues. But I see no attempt to quantify the role of this issue vs. unemployment due to demand insufficiency. So it's hard to justify the conclusion that "there is little or nothing the Fed can do about the currently-high unemployment rate". Will: By "steady state unemployment" I assume you mean natural rate. I'm not thinking in terms of that. I don't think anyone knows what that is. Last anonymous: "demand insufficiency" is bad language. You can't separate what you might think of as demand insufficiency unemployment from "structural" unemployment. It's all unemployment. You can't see unemployment and think: We need more government spending. You have to ask serious questions about what the spending is for and how it makes us better off. Ah. So my careless use of Keynesian terminology got you off the hook. Let me rephrase: do the structural employment problems you describe here explain all current unemployment; and if so, can you defend this conclusion quantitatively? Quantitatively, I can't say much. I told you a story, looked at some data, and made some arguments about how my story fits what I'm seeing. To do the quantitative analysis I need a serious model, and I need to sit down for a few months and come up with some quantitative measures. Now, what I think you have in mind is that some of the unemployment we are seeing is due to sticky wages and prices. I think we can agree that the recession is about a large financial shock to the economy, and I have discussed some sectoral issues having to do with long-run structural change, and the housing sector, in part related to that financial shock. What makes you think that sticky wages and prices are an important factor in what is going on? Is that just blind faith in Old Keynesian economics, or what? Obviously the prices of houses aren't sticky. Do you think that the nominal wages of people who were formerly employed in building houses are sticky downward, and they are unemployed because they would not take wage cuts? I see plenty of anecdotes about nominal wage cuts in various sectors of the economy. What do you think is going on? Well, I could look at the same data you've provided and observe that unemployment has risen and output declined across all regions and sectors, and tell a story that this suggests what you call an Old Keynesian explanation. But I'd have to sit down for a few months and come up with some quantitative measures. See what I did there? My question is simple: without doing the few months of work needed, how can you (or Kocherlakota, with whom you seem to agree) conclude that "there is little or nothing the Fed can do about the currently-high unemployment rate"? Blind faith? No, not blind faith (see the above). Note that I just showed you some big differences across sectors. While "output declined across all regions and sectors," the declines were much larger in some regions and sectors than in others. You are the one who is proposing the government intervention, so you have to make the case that it is the right one, and aimed at the right "problem." He says its not enough to think of it as a labor mismatch problem, we also need to look at factors affecting new firm formation, and he gives a reference to a paper on this by Stavanger and Kedrosky. Other commentators have argued that a lack of dynamism in the financial sector, due to the incumbent protection scheme operated by the government, can infect the whole economy and thus perhaps reduce new firm and new job creation. It does seem that the whole Keynesian language of "AD insufficiency" is anachronistic and not useful given the amount of dis-aggregated data available to us. And the same goes for the representative agent one-good aggregate production function approaches beloved of the Prescott school. Dis-aggregation and heterogeneity is the wave of the future. The other "new" aspect of the past two recession is the increasing percentage of job losses coming in services. A study I saw last year calculated that roughly half of job losses have come from non goods-producing sectors. The number in 1980's was, if I remember correctly, less than 10%. The traditional way of thinking about the output gap conceives of factories as holding a "potential energy" of production during recessions. All that has to happen is to coax workers back to those idle production lines (by lowering real wages), and presto, growth returns to trend. How this applies to waiters, real estate agents and manicurists is not as clear. In each case, to employ these workers requires a lower asset (or rent) price as much as a lower real wage. Real estate agents could be much in demand if housing markets were allowed to clear, and restaurant start-ups would increase if banks had to unload commercial real estate at lower prices instead of hiding losses. The attempt to prop up the banking system is getting in the way of service-sector employment growth. I'm glad to see you disapprove of making policy recommendations before completing the work necessary to establish the efficacy of such policies. Fortunately, my comments contain no recommendations. On the other hand, looking at your post I see some nice preliminary work suggesting that some, currently unquantifiable, proportion of the unemployed are out of work for structural reasons. Then I find "there is little or nothing the Fed can do about the currently-high unemployment rate," which looks like a policy recommendation based on this incomplete work. Still, I'm glad you at least agree with the principle that one should not propose policies without determining that they are correct. Now if only we can get Kocherlakota and his colleagues to live by the same principles. Good points. The financial side and the allocational effects of the interventions are important I think. I can see you like word games. "Fortunately, my comments contain no recommendations." Sure. We know where that "demand insufficiency" argument is headed. Making policy is about doing it on the fly, with all the information you have. This is what I'm doing here. I've got some information. You have some information. Kocherlakota has more, because he has a staff who can do some work for him. One principle of policymaking is that, unless you have a good reason to intervene, you don't do it. Kocerlakota looks at the Beveridge curve issue and says: hmmm, maybe some of this high unemployment rate is due to sectoral reallocation, and that's not a "problem" the Fed can solve. I'm saying: hmmm, maybe there are other reasons to think that sectoral reallocation is important. So far I haven't learned much from your comments, other than you like to argue. "What makes you think that sticky wages and prices are an important factor in what is going on?" Sticky wages are a big problem in a public sector. Sticky prices in long-term financial contracts that were signed before the crisis are an even bigger problem, they have caused housing market dysfunction, they have caused unnecessary problems in private sector balance sheets etc. "Sticky wages are a big problem in a public sector." Have you heard about furloughs? "Sticky prices in long-term financial contracts that were signed before the crisis are an even bigger problem"
That's a different problem. Financial contracts, e.g. mortgage loan contracts, are fixed in nominal terms. If you get lower-than-anticipated inflation, then you redistribute from borrowers to lenders. There are more defaults, and that can give rise to deadweight losses. I think the big problem in the housing market has been the unanticipated decrease in the relative price of housing, not less-than-anticipated inflation. As I said, the problem is not that house prices are sticky in nominal terms. Keynesians are worried about prices and wages not being flexible enough. I think two thirds of the problem in the housing market consists of the unanticipated relative shock, and one third is related to lower-than-anticipated inflation. The other big problem with sticky financial contracts is the whole financial sector. Here again, relative shocks explain two thirds of the problem, but one third of the decreased financial intermediation capacity was caused by deflationary shock. "Have you heard about furloughs?" Furloughs or no furloughs, but the labour market in the public sector is less efficient than in the private sector, and wages in public sector are less flexible downwards. "I think two thirds of the problem in the housing market consists of the unanticipated relative shock, and one third is related to lower-than-anticipated inflation." Where does the 1/3 and 2/3 come from? Do you think a drop in the inflation rate from 2% to 0.8% is a big deal? "wages in public sector are less flexible downwards." Maybe you think this is because there is more unionization in the public sector. But look at what is happening in California. Better still, look up the "Social Contract" in Ontario in 1993, which was enacted by a socialist government with strong labor union connections. When push comes to shove, nominal wages can in fact fall in the public sector. Then there is the question of whether public sector wage flexibility even matters to this issue. I think what Keynesians have in mind is that at least some of the unemployment we are seeing is due to sticky wages, but the mechanism they have in mind relates to the private sector. Yes, drop in the inflation rate from 2% to 0.8% is a very big deal. The reason is leverage. The equity capital of financial institutions is a tiny percentage of assets, and expected 1% inflation shortfall over 3 years would be a very significant burden for them. In early January 2009, according to inflation swaps, markets expected 0% inflation in 2009-2013. No wonder credit markets froze. "When push comes to shove, nominal wages can in fact fall in the public sector." Let's hope a fall in nominal wages will save Greece from bankruptcy. "Yes, drop in the inflation rate from 2% to 0.8% is a very big deal." According to that calculation, the drop in the inflation rate from 15% in 1980 to 5% a couple of years later should have been monumental. The 81/82 recession was somewhat severe, but it ended reasonably quickly. Then we go from the 80s to the 90s: another significant drop in average inflation. But the 90s were good times. What was going on there? Current accounting standards make banks much more sensitive to temporary mark-to-market losses than in the past. This all means that in current recession the pace of recovery and the extent of financial intermediation supplied is more sensitive to inflationary expectations than it was in the past. shocks, by Gabaix and Carvalho. They construct a DSGE model. The latest version is Sept 19th, so hot off the press! This is the kind of macro I think will come to dominate.The primitive nature of Prescott RBC and current NK models will eventually become obvious, and of course it should go without saying that the IS/LM stuff beloved of Krugman and deLong is tres vieux chapeau. Hayek famously said that the aggregates of Mr Keynes conceal the fundamental processes at work. That criticism goes too for the macro I learned at grad school in the early 90s. I detested the over-aggregation but I really think these guys are onto something. Yes, that's very interesting. I hadn't seen the Gabaix/Carvalho paper. There is an older literature on sectoral issues as well. In the early RBC days, Long and Plosser's "Real Business Cycles" paper paid some attention to the sectoral detail. David Lilien had a paper where he constructed a sectoral dispersion measure and argued that it was correlated with GDP fluctuations. Richard Rogerson, Steve Davis, Kevin Murphy, and others worked on sectoral allocation. I saw Gabaix present the paper with Carvalho at Minnesota macro this summer. It's a very interesting decomposition, but the thing that irked me is that they take shifts in relative sectoral productivity as exogenous. That's not a whole lot of progress in terms of structural intuition/understanding from the one-sector RBC model. Nevertheless, the basic idea that the overall economy will be more volatile when sectoral diversification is low is pretty intuitive.